How many solar panels needed? The cost of solar panels in Australia has greatly reduced in recent years. These days, solar panels are priced anywhere from under a hundred dollars to upwards of five hundred dollars each. The cost of solar panels is depending on various factors which will be explained here. It’s very important when selecting the best size of solar panels to use for your solar power system installation to bear in mind a few crucial factors aside from the price tag. Your purchase decision is one you’ll be living with for a very long time and you need to get the best return on your investment. Don’t base a buying decision on solar panel cost alone. Following are a few tips for choosing the best modules for your installation situation. The cost of solar panels depends on a number of factors. Generally speaking, in relation to modules suitable for use on a home and as part of a grid connect system installation, they cost a few hundred dollars each with subsidies taken into consideration. and any certifications the solar panel might have. The price you’ll pay will also depend on the number of panels as part of a package if you’re buying a full system. The more modules in the system, the less cost per unit generally speaking. However, choosing solar panels on price alone is not wise. What you select may not fit the area you wish to install it, or the brand/model may not have the necessary certifications to qualify for government rebates. The modules may not provide the best performance to help ensure economic payback of the power produced. Or perhaps there is no solid warranty from a well-established company. In addition to cost, when choosing the best solar panel for your installation situation, it is important to consider both how it is manufactured and what materials are used. We consider there to be three tiers of manufacturer quality and Energy Matters only supplies solar panels from the first tier. Tier one includes the top 2 percent of solar PV (photovoltaic) panel manufacturers. We consider Tier one manufacturers are those that are vertically integrated. This means they control each stage of the manufacturing process. These companies invest heavily in research and development, use advanced robotic processes and have been manufacturing solar panels for more than 5 years. Tier one producers use the purest and best grade of silicon to produce solar cells. The higher the silicon grade, the longer the solar cell will last and the better it will perform in converting the sun’s energy to electricity. Tier one manufacturers produce some of the best performing solar panels and these can often be acquired at a very reasonable price. Modules produced by Tier 1 manufacturers include REC Solar, Flex, SunPower, and JA Solar; all of which are used in Energy Matters’ range of solar power systems. However, “Tier 1” is a claim that some manufacturers make that don’t fit our definition – so it’s important to understand not all claiming to be Tier 1 are equal. Quality can vary greatly between Tier 1 manufacturers, so this should only be an aspect of due diligence when searching for the best solar panels for your needs. Tier two includes companies who invest less in research and development, are reliant on both robotic and manual assembly on production lines and have often been in solar panel manufacture for 2 – 5 years. These Tier two manufacturers can produce good panels at good prices, but it can be a hit and miss affair. Tier three encompasses 90% of new solar PV manufacturers. These companies assemble panels only, they usually don’t manufacture their own cells and don’t invest in research and development. While often available at a cheaper price, tier three manufacturers use human production lines for manual soldering of solar cells, which often isn’t the best approach as quality can vary operator to operator and day to day. A Tier Three solar panel may in the long run cost you much more in terms of reliability and electricity output. As not all module manufacturers are equal and there are a variety of other factors that should influence your purchase decision rather than focusing solely on cost. This is the range a panel will either exceed or not meet its rated power. For example, a solar module you purchase may have a ‘nameplate’ wattage of 200 watts; but due to quality control issues, the output in ideal conditions may in reality only be 195 watts. A positive tolerance rating means the module will not only generate 200 watts, but perhaps more under standard testing conditions. The temperature co-efficient rating is important to determine what the impact heat has on a solar panel’s operation after installation. The lower the percentage per degree Celsius, the better. The price of a module with low temperature co-efficiency can be a little more, but in Australia’s often hot conditions, a little extra cost can be worth it. The efficiency of how a solar panel converts light into electrical energy will determine how much power your system generates. If two solar panels cost the same, but one has a higher conversion efficiency; then that module provides the better value for money, assuming the claimed efficiencies are correct. PID stands for potential-induced degradation. Caused by stray currents triggered by certain climate conditions; the phenomenon can cause substantial power loss. Good solar panels will display little or no PID. LID stands for Light induced degradation. This is a process that occurs in the first few months after solar panels are installed. While this stabilises after a period, it can reduce the amount of power the module produces. A good solar panel will have little or no LID. Another important aspect to look at is the embodied energy of the solar panel. That is how energy intensive the production of the panel was and how quickly it will have paid itself back by producing more energy. Consider this aspect an environmental cost. The durability or longevity of a solar panel warranty is important for a number of reasons – it can be an indicator of the manufacturer’s confidence in its products. Reputable solar panels will have a performance warranty a period of 25 years. All of our key modules; including REC Solar, feature this 25 year warranty period. However, an important point to remember about warranty is that it will only be honoured for as long as the company operates. It’s another reason to select a well known brand of module rather than purchase an obscure low-cost brand that may disappear overnight. As you most likely won’t be able to buy solar panels directly from the manufacturer, your selection of installer and retailer is also important. It’s best to choose an installation company that is a service agent for solar panel warranty work for the manufacturer you select. This is because if you do strike a problem, the turnaround time to a resolution will be far faster. The capacity of the solar panel in Watts will directly affect the cost, as solar panels are usually priced and compared in dollars per Watt. Watts are related to the output of each module. This means a 100 Watt panel installed and operating under ideal conditions will generate 100 watt-hours of electricity each hour. A 200 Watt panel will generate 200 watt-hours each hour. Therefore, expect to pay up to double the price for the 200 Watt panel, compared to the purchase cost of a 100 Watt module. The output of a panel also affects the size of the panel, meaning the 200 watt panel will be larger than the 100 Watt module. The type of solar cells used in its production also determines the size of the solar panel. They key issue to consider is that your system sizing is enough to power your appliances, and that the solar panels will physically fit in the area you wish to install them. Your northerly facing roof space is very valuable solar power real estate, so you’ll need to consider carefully your future plans. If at some stage you will wish to install more solar panels, you need to ensure you’ll have the space to do so. Otherwise you may find you’ll need to replace existing modules well before the end of their serviceable life. Increasingly, west facing panels are also very useful. Modules use 3 main types of solar cells. The best type for you will vary depending on the installation application. Monocrystalline silicon: this offers high efficiency and good heat tolerance characteristics in a small footprint. Polycrystalline (or multi-crystalline) silicon cell based solar panels are now the most popular choice in residential installs. Recent improvements in polycrystalline panel technology have resulted in the development of modules equal to or better than many monocrystalline brands in terms of size, efficiency and heat tolerance. Two examples of leading polycrystalline modules are REC and JA Solar panels. Flex produces both monocrystalline and polycrystalline solar panels. Flex is the owner of Energy Matters. Amorphous (or thin-film) silicon uses the least amount of silicon. Thin film panels are generally less efficient than other solar cell types. Consider how the module is manufactured and the materials used. Carefully research how the panels perform in real world situations. This includes positive tolerance, temperature co-efficient rating, PID and LID resistance and efficiency. Compare the warranty details of the solar panels you are considering buying. Questions? Contact our team of friendly experts for free, no-obligation advice on the best solar panels and full systems for your circumstances. 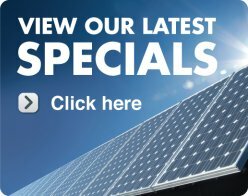 You can also generate a quick solar quote or view our current system specials.